Shown below is a descriptive Citrus Fruit List, along with valuable nutritional info. This list is not a complete list, as many exotic hybrids of citrus fruits are known to exist. The word citrus refers to a group of acidic fruits that are easily peeled and segmented. 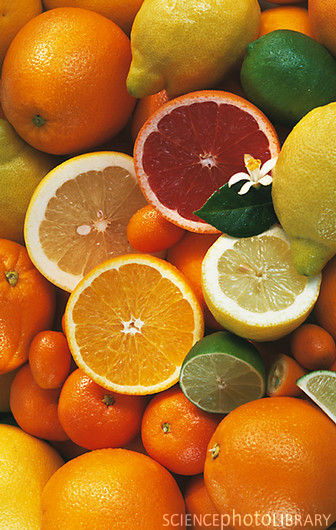 Basic citrus fruits are commonly genetically combined to create hybrid citrus fruits. Blood Orange - A type of orange with deep red fruit. Clementine - A deep orange citrus fruit similar to a Tangerine. Grapefruit - A large, yellow citrus fruit, often served cut in half, so the fruit can be scooped out with a spoon. Lemon - A sour yellow citrus fruit, not generally eaten by itself, but more often used to flavor drinks and seafood entrees. Lemons also make wonderful dessert dishes, if you add enough sugar. Types of lemon include Meyer Lemon, which is a sweeter lemon with a thinner rind than other lemons. Lime - A citrus fruit most commonly used for flavoring recipes. Types of Lime include Key Limes, os named because they were originally grown in the Florida Keys. Orange - A citrus fruit commonly eaten fresh, with more Vitamin C than most other citrus fruits. Types of orange include Bitter Orange, Blood Orange, and Mandarin Orange, among others. Tangerine - An orange colored citrus fruit thought to be a type of Mandarin Orange. Ugli - A Jamaican Tangelo. A basic Citrus Fruit List reveals that a 100-gram serving of orange, grapefruit, or tangerine has anywhere from 30 to 55 calories, averaging about 10 grams of total carbohydrates, and an average of 9 grams of sugar. Oranges and grapefruit have low glycemic index scores, which means their natural sugars don't cause too sharp an increase in blood sugar. Citrus fruits are loaded with antioxidants, fiber, and flavonoids, as well as being rich in Vitamin C, with one small orange containing 53 milligrams. Hit this link for Traditional American Recipes. Go here for a Healthy Weight Chart. See this page for Many Delicious, Healthy Recipes.